Midway Art Association Gallery in Midway. Courtesy Midway Art Association. The work of local artists who find inspiration in and celebrate the natural splendor of their surroundings has found a place in the Midway Art Gallery, which opened to the public on Jan. 26 – 27. A group from diverse backgrounds and trainings, these artists share appreciation for scenes from the natural world, particularly those of Utah’s national parks and open spaces. 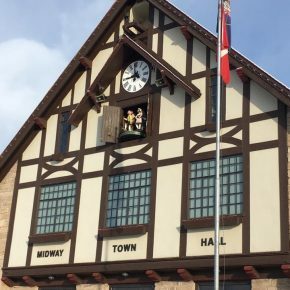 Attached to the Midway Town Hall, in Midway’s charming Germanic town center, the space was the center of bustling activity during the opening weekend as locals and visitors welcomed the new addition to the community. Present at the opening were the artists and the president and vice-president of the Midway Art Association, Jerry Watterworth and Norma Burgner, who worked with Midway Town Hall in securing the space and bringing the long-awaited gallery to life. “The MAA Gallery was the vision of several MAA Board members who wanted to create a permanent space for MAA artist members to exhibit and sell art, and to provide a source of unique local paintings for buyers of art,” says Watterworth. When the approximately 300 square-foot space became available, the full Board embraced the concept with “unanimous enthusiasm.” After receiving approval from the City Council, the board got busy designing the intimate space to their needs. Jim Baluff discusses some of the works on display. Crowd during the opening weekend of the gallery. 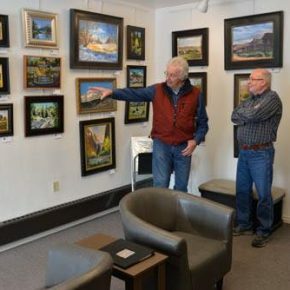 The gallery will be open every Friday and Saturday and show the works of several artists from the Midway Art Association at a time, revolving through their pieces. The paintings, which vary between contemplative plein-air paintings of the local landscape to Western scenes on horseback to picturesque European village scenes, all speak to the individual styles and personalities of the members of the Midway Art Association. Featured in the gallery opening were artists Jeanne LaRae Lagano, Steve Stauffer, Brian J. Thayne, Stephen Henry, Jim Baluff, Pamela Flynn, and C. Scott Bevan, whose work will be on display for the first two months the gallery is open. Midway Art Association members Brian Thayne, Norma Burgner, Stephen Henry, Jerry Watterworth and Steve Stauffer . 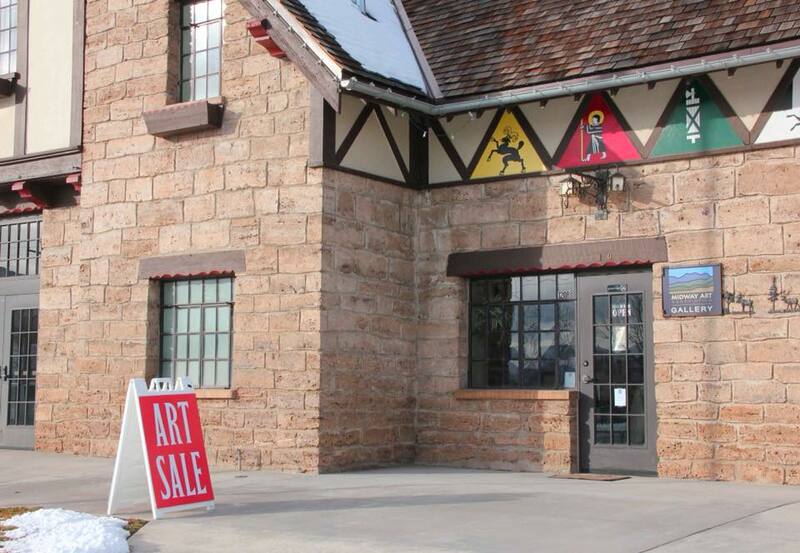 Watterworth, as well as the artists present, expressed confidence and excitement in the future of the artistic community of Midway and Heber Valley. The first weekend of the gallery was a success, with artists selling many prized pieces to visitors, and the community reaction overwhelmingly positive. 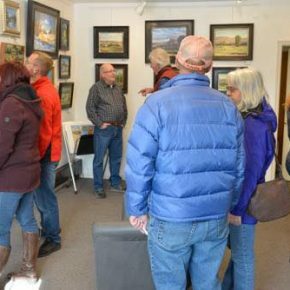 “As only one of two art galleries in Wasatch County, we hope to attract those locals seeking unique original art, as well as visitors to Heber Valley and those from the Salt Lake Valley seeking a source for local art,” Watterworth said. 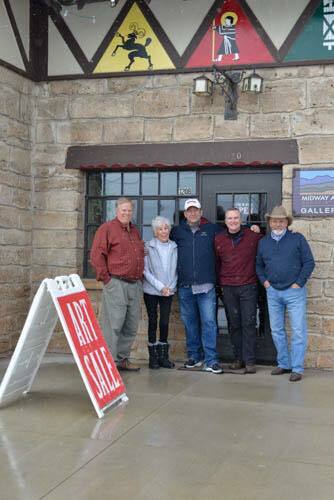 The gallery, representing both the talents of Utah’s artists and its natural beauty, as well as the hard work and dedication of the Midway Art Association, surely will be an artistic destination in Heber Valley, helping visitors see their surroundings in new and meaningful ways. “Midway Arts Association Gallery Viewing,” 160 W. Main St., Midway, through May 26, gohebervalley.com.